Most likely you already are familiar with Hubsan manufacturer, they have produced several drones which have been a success in the market. As such, they have done it once again with their model H501S X4 released back in 2015. THE GOOD : H501S X4 has a wide set of useful features, most powered by its GPS system. Such features are Headless Mode, Follow Me Mode, OSD Live data, One-Key Return and Landing. This drone is ideal for “selfie” photos due to its Follow Me mode and 1080p HD onboard Camera. H501S also has a slightly above average flight time of 20 minutes and a control distance of 300 meters. On top of all this H501S X4 features KV1650 PM1806 brushless motors, very durable. THE BAD : Sometimes altitude of the quadcopter may suddenly drop when speed increases. However, it is nothing to worry about. BOTTOM LINE : Overall, it is a great value for your money. 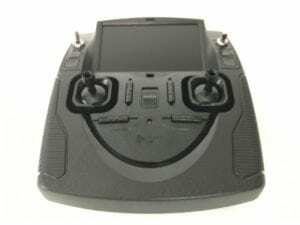 Complete FPV package, wide set of features including GPS. H501S X4 is one of the best Hubsan products. Even if you are a beginner, H501S X4 it is easy to start with. First of all, let’s start by discussing Hubsan H501S X4 features, in my opinion one of H501S X4 strongest aspects. A very feature rich quadcopter with all you need for high-quality performance flights for a very affordable price. Firstly, it includes a GPS in both quadcopter and remote, which enables Follow Me mode. As many drone enthusiasts are mentioning, it is the perfect affordable quadcopter for “selfie” photos. Since the drone tracks the remote and autonomously follows it, without any pilot’s input, it is perfect for selfies. Focus on the photograph or video, while drone automatically follows you! Other amazingly useful features are Barometer Altitude Hold (drone will lock on a specific height and maintain it autonomously without pilot’s input), Headless Mode (drone will fly towards the exact commanded orientation despite where the front of the drone is pointing at). More great features include OSD Live data, directly displayed on the FPV (First Person View) monitor built-in into the remote controller. OSD displayed information includes: quadcopter position, altitude, speed, battery power, among others). Lastly, but also very important and useful is the One-Key Return Landing, as the name suggests the drone will return to where began flight (thanks to tis GPS system) and will automatically land. As you can see this Hubsan is one of the most feature rich quadcopter within its price range. If your priority when buying a drone is the set of features, than H501S X4 is the best bang for your buck! This small (22 x 22 x 7cm) quadcopter besides the wide set of features and First Person View camera, also has brushless motors! Hubsan H501S X4 might just be one of the best drones ever produced by Hubsan. You will be amazed at its specifications! And of course, we at Drones Globe are always delighted to bring to you the most accurate and important drone related information. Without further due, let us move to our review! If you are a camera fan, and if you specially love real-time video transmission or are just looking forward to try it. Than I’m happy to tell you this drone comes with a complete FPV package ready to fly out of the box. H501S captures the image with its 1080p resolution HD camera. The camera is built-in inside the quadcopter (on-board) and cannot be removed. Much like other Hubsan products. The drone transmits live video directly to the monitor built in the remote controller. Live video works in 5.8 Ghz frequency and 4 channel remote controller in 2.4 Ghz, therefore there is no disturbance in transmission. Besides watching the live video, you can also take photos and record videos which are saved into a Micro-SD card. All of this can be accessed via the remote controller. H501S X4 has one of the best flight times for drones within its price range. This drone makes use of a larger than normal battery, a long and powerful 7.4V 2700mAh Lipo battery which is able to power up to 20 minutes of flight time. Considering the average flight time for drones with this price range is 15 minutes, than we can tell how H501S X4 once again really stands out from the rest. H501S X4 has a wide set of useful and powerful features, a longer than average flight time, a complete FPV package, what else do we need? We need long range, and Hubsan delivers it! This drone features an astonishing 300 meters, somewhat of a long range considering other drones with its price. The only other toy manufacturer which is capable of featuring a 300 meter control distance in a toy drone and still keeping it at an affordable price is JJRC. H501S X4 battery weighs 105g and takes around 150 minutes to charge. Another important thing to mention about this drone are the KV1650 PM1806 brushless motors, most toy drones have brushed motors, but not this one. Brushless motors, besides being slightly more powerful are much more durable. What is your opinion on this review? 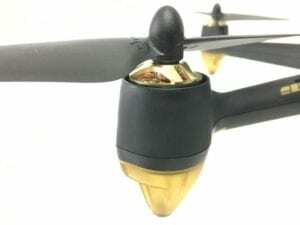 What do you think of this small and yet powerful and fun quadcopter? Have you ever flown a drone with this many features and flight time? For a very affordable price you can experience this amazing drone! Don’t forget to let us know on the comment section below, we at Drones Globe always look forward to read your comments. Also, bookmark our page for more weekly reviews and guides on more affordable and interesting drones. Happy flying fellow drone lovers!